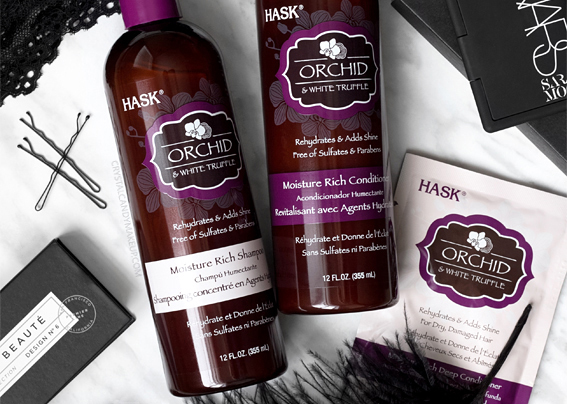 Enriched with European orchid and white truffle oil, Hask's new Orchid & White Truffle hair care range is said to help hydrate, control frizz and restore brittle hair. Formulated for all hair types, these products are free of sulfates and parabens. 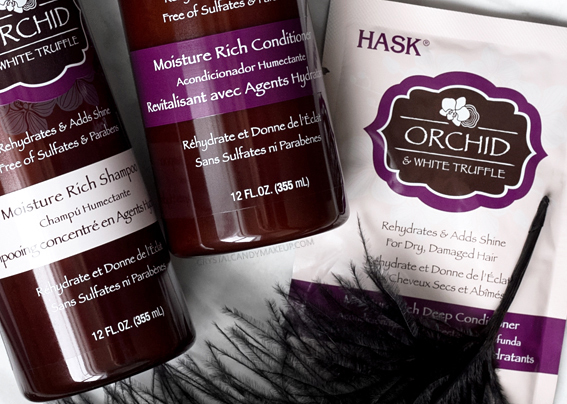 I already tried a few Hask products in the past, so the brand wasn't new to me. The products are packed with hair-loving ingredients and the price is hard to beat! The Orchid & White Truffle Moisture Rich Shampoo ($7.99 CAD for 355ml) produces abundant lather without the use of sulfates. The formula isn't particularly hydrating, to be honest, but it cleanses my hair without being overly drying. Next up is the Orchid & White Truffle Moisture Rich Conditioner ($7.99 CAD for 355ml). Ohhh this stuff is goooood! This thick conditioner contains hydrolyzed pea protein, shea butter, white truffle oil, olive oil, coconut oil, orchid extract and panthenol. It detangles my hair very easily with a small amount of product and it doesn't weigh my hair down. Last but not least, the Orchid & White Truffle Moisture Rich Deep Conditioner ($3.49 CAD for 50g). 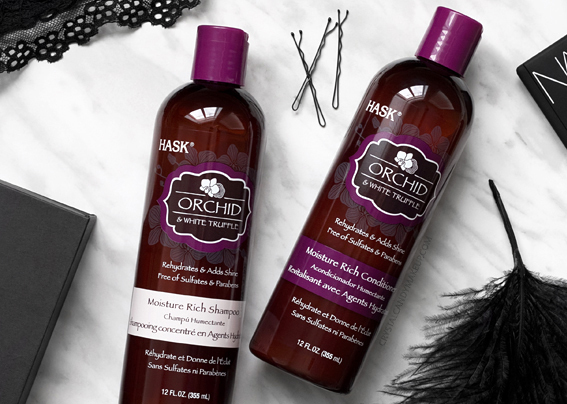 If you've never tried Hask's deep conditioners, you are seriously missing out! I highly recommend them! They are very concentrated so a packet usually last me 3-4 uses (and I have long hair). This one isn't my favorite though, as it tends to weigh my hair down a little bit. The Argan Oil Deep Conditioner seems to work better for my hair type. Did this range help control frizz and hydrate my hair? Yes, it did! My hair is less frizzy, softer and definitely more shiny. Impressive for the price! Oh and I like the woody oriental scent too! And guess what? The deep conditioner is formulated without silicones, which is awesome if you are trying to avoid this ingredient. Please note that the shampoo and conditioner contains silicones though (I personally don't mind, but yeah.). This brand is available for purchase online at amazon.ca and also available at Jean Coutu and WalMart. These sound amazing!! Do they smell as good as they sound?! These sound great. I was going to ask the same, how do they smell? It's a woody oriental scent! Yes you should try the treatments, they are sooo good!! Sounds soooo luxurious! I This sounds like it would be a fairly expensive treatment but wow! It's nice to have some affordable options too! The Argan Oil treatment is as good as my Kerastase masks... just saying! You should, these products are great! The Orchid & White Truffle Moisture Rich Deep Conditioner exceeded my expectations. I am going through menopause and it has wreaked havoc on my hair. My hair has been dry, brittle and falling out. This mask has made my hair soft and shiney. It is much easier to comb and less hair falls out. I used this mask several times and got the same results. The fragrance is wonderful, they should make a body butter. I look forward to trying the Shampoo and Conditioner. Hi do you still use this line? They sound great, but I'm wondering if they work long term or if they are just a short term fix..